Sept 16 Heading home …. 34 degrees last night .. furnace was getting a workout. Furnace keeps us warm .. but .. it is very loud ..we would wake up every time it kicked in. After breakfast .. showers .. we’ll start packing up .. should be on the road by 10:00… Bright .. sunny day .. we’ll take our time driving back .. should be home by early afternoon … plan is to sleep late tomorrow ! It’s been a fun trip .. even though we encountered a lot of bad weather .. We explored parts of PA we’ve never seen .. checked off a few items on our bucket list.. Left on Aug 31 .. time went by very fast .. We’re hoping we can make one more trip before covering up the Casita .. just a short local trip .. NY State ?? Since tour was over around lunch time .. we checked around for a place to eat .. ended up at Pizza place called … ‘Rick’s Dough Boys’ … They make their own dough .. sauce and breads… We each had a ‘personal’ size pie .. excellent !! Terri has nominated their pizza as the second best we’ve ever had … I agree !! We gave a slight edge to ‘Serious Pie’ in Seattle .. If we had the means of warming it up .. We would have brought a pie back to Casita ! After leaving Dough Boys .. we headed to town called Ridgway … Ridgway’s claim to fame is their annual ‘Chain Carvers Rendezvous’ .. last week of Feb 200 carvers from around the world come to Ridgway to show off their carvings … at the end of the week .. they auction off one of their pieces.. 25,000 folks attended last years event .. 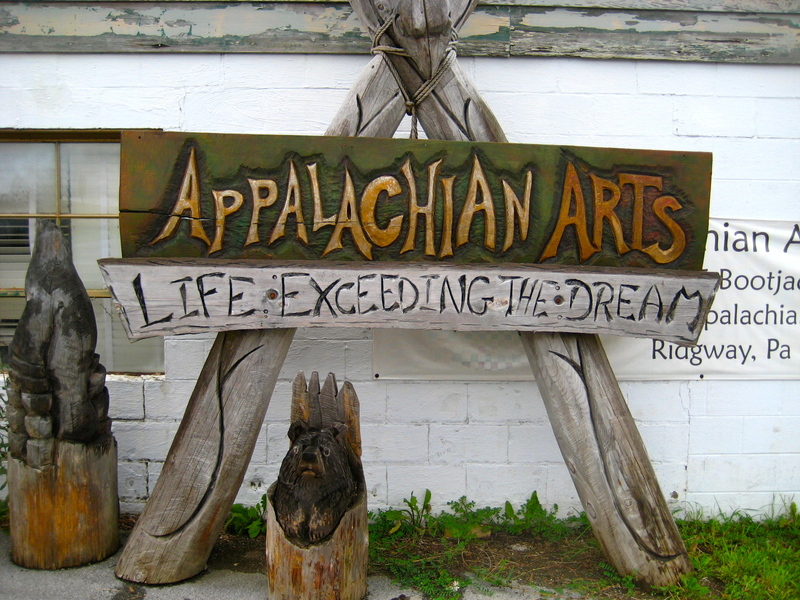 Sounds like an interesting event ..we think we might attend next years chainsaw extravaganza .. As we drove around town .. we noticed several wood carvings placed in front of business’s and churches .. On the way out of town we stopped at a place called ‘Appalachian Arts Studio’ that had quite a few chain saw sculptures outside .. with a carver creating one as we watched … amazing what can be done with a chainsaw …. Sept 14 Leaving this morning for next stop ….. Survived last nights thunder/lightning/wind/rain/hail storm … crazy night .. felt like some of lightning strikes were directly over our heads .. a little creepy in that there is only one other couple camping in campsite .. there are approx 20 seasonal trailers in campground .. but no one is in them .. so we we basically have campgrounds to ourselves .. Casita is parked on a grassy site … so I thought we’d wake up in the morning to a muddy mess outside .. but looks like ground absorbed almost all of the water … Cloudy skies this morning .. but .. looks like skies want to clear up .. Heading to town named Woodlands this morning … no rush to leave .. it’s only about 2 hours from here .. Woodlands will probably be our last campsite on this trip .. we’ll stay there for 2 nights .. then head home .. we should be home on Friday . 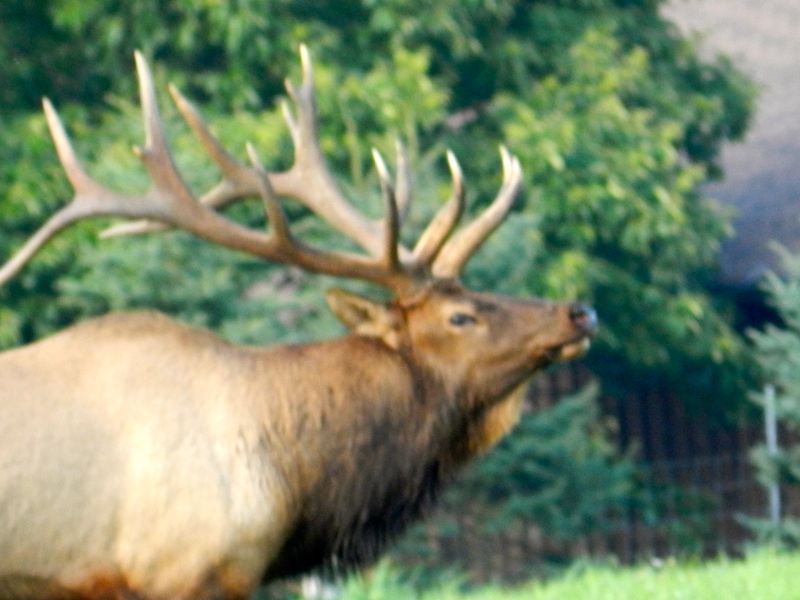 The elk have been located … saw herds of them at ‘Elk Country Visitor Center’ .. approx 60 min from out campsite .. One the best visitor centers we’ve seen … elk were just roaming around open fields .. at times getting pretty close. Quite a few people were at the visitors center .. more than we thought .. There were a couple of walking paths around the area for people to walk around so they could view the elk without invading their turf .. Seems as though Sept is the ‘mating’ season .. so the bull elks were trying to keep their ‘group’ together .. and away from other bull elk .. Bull elks have some pretty serious horns .. and they can really let out loud sounds called bugle-ing .. trying to impress the ladies as well as discourage any other bull elk from wandering too close … Stayed at Visitor Center for almost 2 hours .. then headed back to campsite … while driving back we noticed elk on peoples lawns .. as well as eating their flowers & landscaping …. just like our BBL deer …. !! Best weather day of trip .. woke up to sunny skies !! This morning was a perfect day to take a hike in Cook Forest .. Took a 2 1/2 mile hike on a very nice trail .. 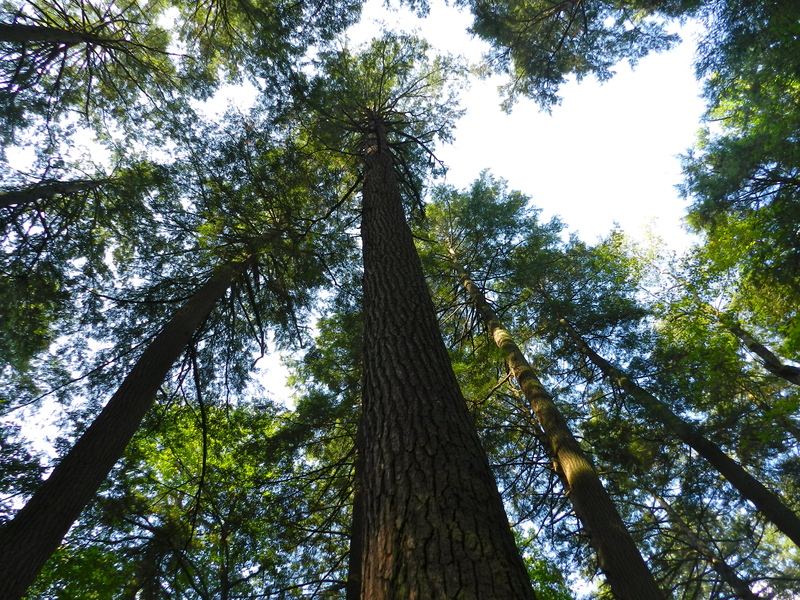 Trail was almost completely covered in shade due to the very high tree cover .. Found out that these tall trees are among the tallest in Eastern region .. over 180 feet tall .. Hike took us an hour .. taking us over some creeks and wooden bridges.. Next we headed to a small town of Clarion .. nice town with quite a few shops on it’s main street .. after driving around for awhile .. we decided to keep driving … after about 30 min .. we ended up in Brooksville … Terri checked her local area brochures as we were driving and we thought town sounded interesting .. As we’ve learned .. these local brochures can be very misleading .. but this time brochure was right on the money .. It was a very nice small town with a scenic main street .. Huge brick court house in middle of town .. buildings were well kept & maintained .. interesting Victorian styled architecture buildings .. Found a nice place to eat lunch .. small grill & pub .. across from court house .. food was excellent .. if we are ever in the area again .. would definitely eat there again ! After walking around main street .. headed back to campsite to make plans for our next stop .. we’re leaving current location tomorrow and will head to a town called Woodland .. approx 2 hours from us.. Woodland’s claim to fame is being the home to a huge herd of Elk …. we’ll be looking for them ! 9:30 pm update …. so much for today’s good weather .. we’re in the middle of a pretty severe thunderstorm .. heavy rain with some hail thrown in !!!! A lot of loud rolling thunder and lightning above us … wish we didn’t have so many trees around us !!! After settling in, we went for a ride to Cook Forest to check things out .. Afternoon weather has been great .. the best we’ve seen during our entire trip .. morning wether was the usual overcast gray skies… Picked up some maps at a Ranger Station .. drove through park .. stopped for a quick trail hike to an overlook .. then back to campsite to start dinner .. and to plan a hike and other adventures for tomorrow … I think our consecutive rain streak will end today … blue skies this afternoon .. so unless the rain clouds roll in tonite .. the streak is history ! No trick photo .. that is real blue sky & sun !!! Our rain streak is alive .. it’s rained every day for the past 10 days … some days we only had showers .. some times it only rained at nite .. how long can this streak continue ?? Campground is very dark and quiet at night … good for sleeping .. No cable and no books to read .. not good for me .. Terri has some books .. but .. she’s read them all … and is now down to one book on the iPad .. no AT&T service at campsite .. so .. she needs to find some service to restock her online book library. Our first excursion this morning was to a place called the Kinzua Bridge .. bridge was built in 1882 and was called the ‘Eighth Wonder of the World’ .. 301 feet high .. 2,053 feet across. It’s primary purpose in the 1800’s was to transport coal across the valley, but also became a popular tourist attraction. Excursion trains provided it’s visitors the ‘thrill’ of riding ‘The Tracks in the Sky’ …. 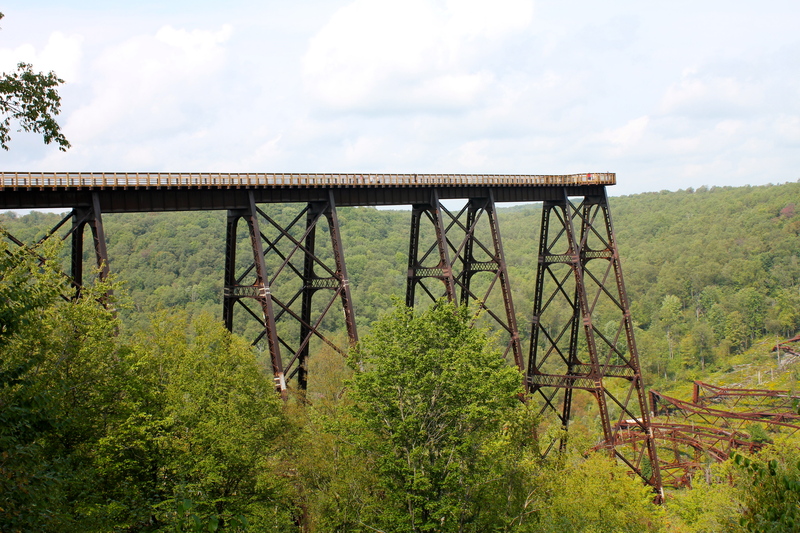 The Kinzua Viaduct (bridge) spanned the Kinzua Gorge for more than a century before it partially collapsed under powerful winds of an F1 tornado in 2003. 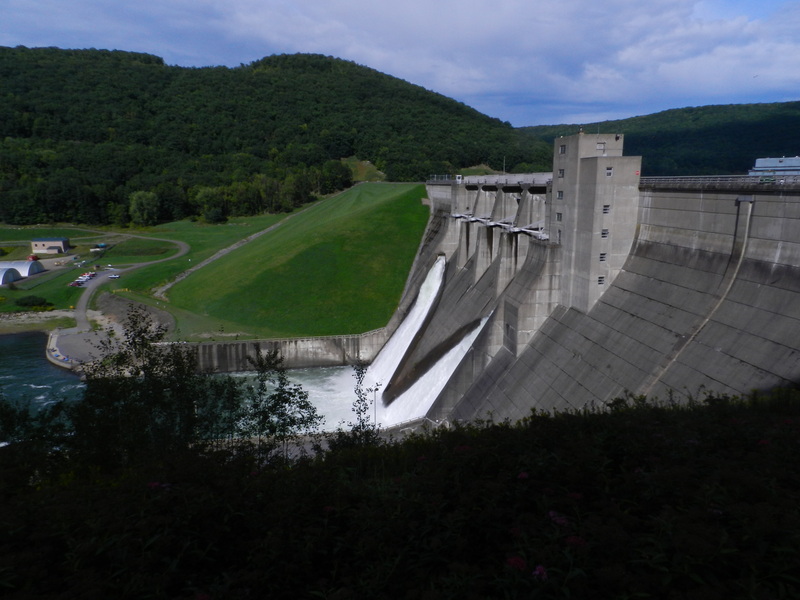 It’s now been reinvented as a pedestrian walkway called The Kinzua Sky Walk. When you walk to the end of the bridge .. there is a glass portal that you can look down and see directly underneath you .. a little freaky .. We’re lucky it wasn’t a windy day .. if it was .. we wouldn’t want to be walking on that bridge !! Reconstruction of bridge is complete and I think the official ‘dedication’ of the bridge is next week.. Place is a very popular local attraction .. and it’s free ! Our next trip was to the Zippo headquarters in Bradford .. Place was pretty neat .. Never owned a cigarette lighter .. but .. this place was very interesting .. they have a lot history going back to WWII .. and their lighter cases are like pieces of art. We toured their museum and were amazed at how many Zippos lighters they had on display … Inside were numerous displays .. a museum .. and of course a place to buy some of their stuff .. Somewhere along the line .. Zippo bought out ‘Case knives’ .. high quality .. collectable type stuff .. expensive stuff ! Parking lot has Zippo lighters on their light posts .. and there was a cool Zippo car that they used to ride around town in the 1950’s to promote their product .. While we were in Bradford, we (Terri) wanted to check out a needlecraft/stitching store … advertisement in brochures seemed like it would be worthwhile to check it out .. wrong .. place was a bust .. Terri was in and out in a few minutes .. but .. the good news was that their was a pretty nice car show on Main Street .. same street as the needlecraft store .. Over a 180 cars were on display .. pretty amazing in that Bradford is a pretty small town. Town appeared to be a very old town with a lot updating/upgrading needing to be done .. a lot of closed business’s and empty store fronts right on Main Street. After walking around checking out cars .. we stopped a Tea Shoppe for a cup of tea and a scone … then it was back to campsite to start thinking about tomorrow’s travels .. ! Sept 10 Checking Out …. Finally got my email account straightened out … on the phone with customer service & tech support for quite awhile .. I’m up and running .. but .. don’t understand why tech support had me make a few changes in mail account parameters .. I just wanted to change my password !!! 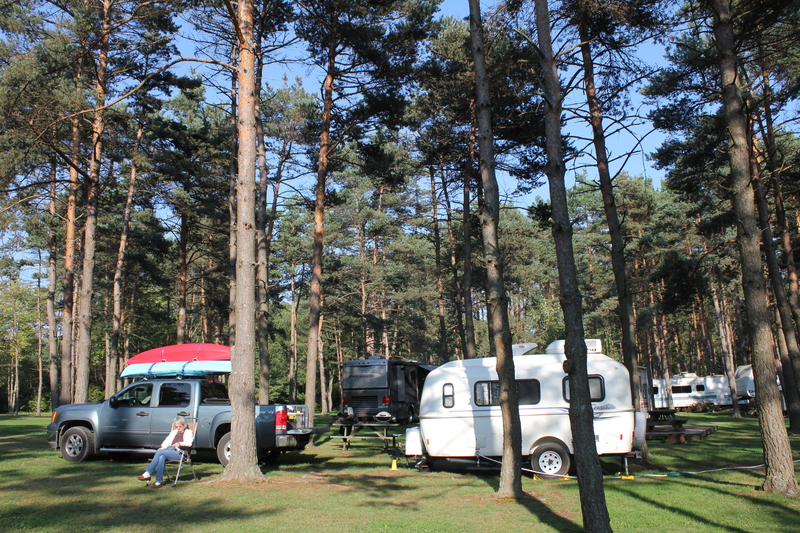 We’ll update blog at our new campsite …. 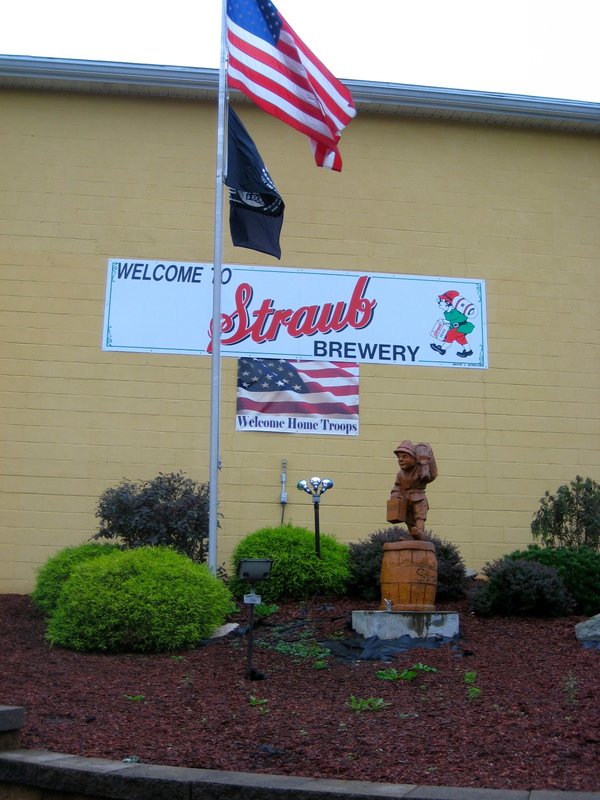 Arrived at our new site .. a few showers when we departed .. and a few more during our trip .. but .. for now .. rain hs stopped .. New campsite is in Allegheny National Forest …. not very many folks in campsite … Internet is a little iffy .. wasn’t working when I first tried it .. seems to be OK now … Roughing it at this site .. no cable TV .. that means no football or baseball games to watch 😦 After we get settled in a little .. we’ll hit the road and do some exploring ….